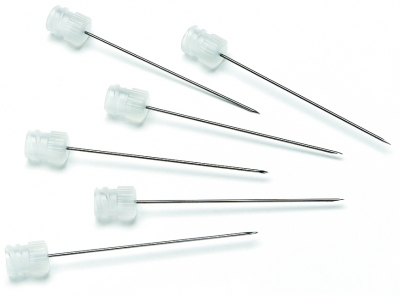 Kel-F hub (KF) needles can be used with Luer Tip (LT) and PTFE Luer Lock (TLL) syringes and connectors. Standard needle length is 2 in. (51 mm). Custom lengths and point styles are available. Luer Tip (LT)- The needles are removable and fit over a ground glass hub which is tapered in the shape of a male luer. The LT termination will accept most hypodermic needles but was designed specifically for use with Hamilton Kel-F needles. This termination increases the dead volume in the syringe, which may not be appropriate for some applications. Autoclavable when disassembled. PTFE Luer Lock (TLL)- This termination has a PTFE, male Luer taper with nickelplated brass locking hub for use with Kel-F needles, metal hub needles, and universal connectors. Also, the TLL is used with Hamilton diluters/dispensers, OEM applications, and manual operations. The version with slots is used during the attachment to some instruments but does not effect the connection to needles. Autoclavable when disassembled, except on 25 mL and greater syringes. Repeated autoclaving will shorten syringe life.